The theme update also integrates with the Options Framework plugin, which offers a much more sleek options interface. 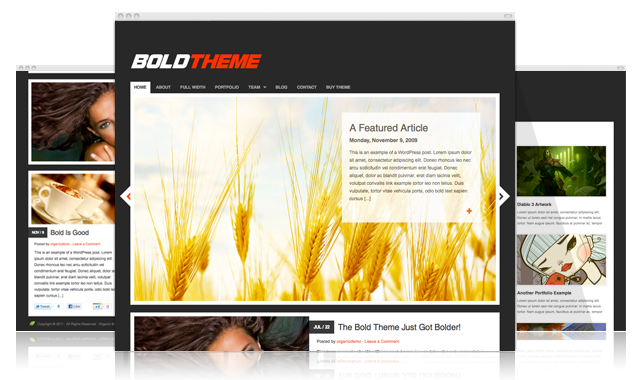 The new featured content slider for the Bold Theme can display an unlimited amount of posts with a featured image or a featured video. Everybody loves to share! With the latest update to the theme, simple Twitter, Facebook and Google Plus buttons have been added to featured home page posts. The theme is now capable of displaying featured videos within the slider, homepage tabber and category pages. Featured images can now be added to pages and page templates to be displayed as a banner image for that particular page. You can display one, two or three column posts on the homepage — allowing for greater control of the homepage layout. The blog and category pagination is now much more accommodating — allowing you to skip ahead to specific page numbers.